Discussion in 'Fluff and Stories' started by Scalenex, Sep 6, 2017. @Slanputin got some inspiration flowing for me by posting Lustrian maps and making me think about land marks and geography. Okay I am trying to make some fluff to stitch together my model collection and fluff pieces. Not all of my pieces are set in Klodorex, but almost all of my characters are from Klodorex or they fight Lizardmen from Klodorex. I never actually decided where Klodorex is figuring it is as near or distant to everything as the plot requires....until now. Look at page 25 of the 8th edition Lizardmen army book, or pull it up here. Northwest corner where there is a small gap in the mountains. Note where it says Monument of Izaatal. That is where Klodorex is. Minor spoilers follow. If you are really sensitive to spoilers, read my pieces in this order. If not, read my pieces anyway. I've vain and like to see the number of views and likes go up. For reasons that follow, the Monument of Izzatal is ideally placed given the events in my fluff pieces. There are lot of landmarks on the map that have a cool sounding name, but no story explanation. At the south of the map, I couldn’t tell you what the three curses of the Thrice-cursed Peaks are. Maybe there were three major battles. Maybe three important people died there. Maybe three curses are mundane like "steep climbs, slippery slope, and high winds." There are lot of blanks to fill in. I need to fill in the Klodorex blanks. Here’s the obvious one, the Monument of Izzatal. Who or what is “Izzatal”? Let us make Izzatal a First Generation Slann who died fighting Daemons during the Great Catastrophe. It’s a Scalenex death, so I’m sure he died heroically and tragically in a way that makes people sad whenever the story is told. I'll work on the details later, but monument to an honored fallen Slann of legendary power is a good baseline. North of the Monument of Izzatal/City of Klodorex is the "Biting Bog." I am not going to come up with an exotic explanation for the title. The Biting Bogs is a big swamp with a lot of biting insects, so much so that the normally bug-tolerant Skinks decided they don't like going there. Frogs and stuff prey on them, bigger creatures prey on them, etc which makes it more dangerous. These things bite too. Basically the only reason Klodorex residents ever go there is to try to pick up some Razordon and Salamander eggs or rare poisonous insects (Salamanders and Razordons bite too). If the Lizardmen don't find the Biting Bogs worth their time, warmbloods probably hate it worse, so the Lizardmen's enemies would rarely pass through willingly or survivingly, so the First wouldn’t even have to patrol it much, until the Biting Bogs became more important in my story Orphaned Temple City. Two greater Daemons, Darfiel and Thazerick, set up a booby trap in a cave hidden in the Biting Bogs. They tried to use an enticing unsolvable riddle to trap the Slann of Klodorex within their own minds causing their bodies to waste away defeating four Slann without a fight. After Kaitar woke the Slann from their trance, the Slann wised up to what was happening and converted the cave into a prison for Darfiel and Thazerick. The Daemons are trapped, but they are able to mystically call out to closely aligned mortal followers of Chaos which drives the plot in future story. Then Klodorex had to start patrolling the area. To the west of the Monument of Izzatal/Klodorex is the Jungle of Green Mists. Again, I don't see the need to come up with an exotic magical source of green mist. Sunlight going through a canopy of leaves makes the slowly rising water vapor look green. A literal minded Skink named this section of jungle. It’s a little confusing because lots of areas of jungles in Lustria have greenish mists. Nothing really noteworthy here. Since the Biting Bogs is a terrible place to march a non-aquatic army, Dark Elves that choose to attack Klodorex and have accurate maps, will choose to march through the Jungle of the Green Mists. That’s just Dark Elves though, other warmblood foes to Klodorex have to come from the east. So there's a lot of battles there, but for story purposes this is generic jungle without a unique name. Only Elves can conceivably land major incursions from the west coast. Everyone else needs to reach Klodorex or the areas near it from the east and march west. Even the areas outside the Biting Bogs are dangerous to march soldiers through. A lot of warmbloods reach the area around Klodorex after wandering around the jungle blindly, but the less you have to slog through a jungle, the better. If your team has very good maps and navigators and wants to go to Klodorex, then the easiest route is to land on the Cactus Coast and march southwest. I'm retconning this as the landing site used in my novella Legacies. The characters making landfall did not have genius navigators but they did have magical navigation. Wait there is no official fluff on the Cactus Coast. Better develop it! Again, I don’t need to come up with an exotic explanation for the name. The area has an abundant supply of a species of cacti found nowhere else. Without a magical explanation, this cannot be an an arid area. The Cactus Coast is sandwiched between the ocean and a tropical jungle with a vaguely nearby mountain range acting like a rain shadow. This is not going to be an arid climate. Let us make this cactus plant very greedy for water. Maybe this high moisture cactus would have especially pretty flowers and make tasty nectar which can be made into potent tequila. Finally, an area Skinks would want to visit! This is why Spektazuma and Klodorex have the best parties. South of Klodorex/the Monument of Izzatal is a swampy area called “The Reeking Mire.” Swamps stink as a rule, but as I'm looking for a place to put my Burn Face Tribe of Savage Orcs near Klodorex, so let’s make the Reeking Mire, in addition to regular swamp stink, this place is home to bunch of sulfuric geysers. I currently described the Burning Face’s main stomping grounds and the Old Faithful-esque geyser that serves as their “Boss” is south of the Reeking Mire where the Reeking Mire gives way to the mountains. The Burning Face’s main stomping grounds was described as a weird patchwork of rocky hills, low lying swamps and small patches of trees and geothermal activity everywhere. Sounds like a good place to have Orcs live. I use the Burn Face tribe of Orcs and Goblins a lot, but no need for spoilers. While the Burn Face Tribe is very good at navigating the Reeking Mire, their true home is south of the swamp where the Reeking Mire gives way to the mountains. In Orphaned Temple City the Lizardmen marched on the Burn Face Tribe traveling through the Reeking Mire. When Renliss fought them, he came the opposite direction through the mountains. So far I've used the Burn Face Tribe in two major stories, but they don't really driven the plot. They remain bit players, but they are still around, so I'm sure I'll use them again. The thought occurred to me that since the Burn Face Tribe is now officially at the base of a large mountain range, I could use the mountains as justification for giving the Burn Face Tribe Cave Squigs. This should be pleasing to @Otzi'mandias. I just need to figure out the Wellspring of Eternity (which is sandwiched between the Reeking Mire and the Jungle of Green Mists) and I need to figure out what Klodorex's relationship to Spekazuma the City of Lenses which is northeast from Klodorex/the Monument of Izzatal. The Wellsprings of Eternity sounds like a place that either beneficial or seeped in mystical power but its right next to the Reeking Mire, so how nice can it be? I need to figure out what sort of McGuffin is there. Why it's important enough to be considered a monument to the Old Ones, but not important enough for the Lizardmen to garrison? Did the Orcs and Goblins that live in the Reeking Mire try to wreck the Wellsprings of Eternity or is too durable or is it too well-hidden for them to even try? Spektazuma is an interesting case. It is so close to my desired location for a Temple City that is mildly tempting to retcon, “My Lizardmen were all based in Spektazuma all along!” but I’ve written so many pieces without mentioning "Spektazuma" that may be weak. They are so close that either Klodorex was probably a satellite city of Spektazuma or Klodorex is made up of Spetazuma refugees or both. If there are any treasures, tombs, or spawning pools in Spektazuma that are still worth defending, that means Klodorex is probably the primary contributor of soldiers for this task. I’m not sure what City of Lenses means. This thread has the reasonable idea of Spektazuma housing an observatory. Assuming the observatory follows real world limitations on observatories, in a misty jungle, you want your observatory to be high above the cloud line. If that’s the case the official map should probably be edited slightly and either have Spektazuma slide an inch or two on the map so it’s in the mountains, or have the mountains stretch down an inch or two in Spektazuma's direction. Fun fact, the second closest official Lizardmen city to the Monument of Izzatal is Tlanxla, the City of the Sky, also located away from the mountains…where a river goes into into a swamp. That means the City of the Sky is below sea level. Good job GW fluff writers! Speaking of mountains, if you look very carefully at the Monument of Izzatal it is on a solitary mountain somewhat removed from other mountains. A lone mountain is enough to attract some attention to itself. But what if the Monument of Itzzatal is BIG. Whether it’s an obelisk, pyramid, statue or Mount Rushmore style carving a giant monument on the top of a solitary mountain would be easy to see at a distance. I’m open to suggestions on what the actual monument should look like. On a relatively cloudless day the monument can be seen for hundreds of miles. It may or may not have magical powers and it may or may not have an associated treasure vault, but it makes an obvious landmark for any clueless warmbloods wandering the jungle looking for a some ruins to loot, so it they think it has magic or treasures to steal even if it doesn’t. Not a lot of warmbloods make it to the east coast of Lustria, but anyone hugging the west coast can probably see the Monument of Izzatal on the aforementioned cloudless days. The Dark Elves and the High Elves probably have the best foreign maps in the worlds, and the Monument of Izzatal is probably on most of their Lustrian maps. I doubt the High Elves ever attacked, but they probably know somethings there. The Elves named it something Elven and the High Elves and Dark Elves probably don’t call it the same thing. Whether the Monument of Izzatal has any tactical or magical value, it marks a holy site for the Lizardmen where the legendary Slann Izzatal died! They don’t want warmbloods to figuratively or literally defile Izzatal’s memory. Whether they read it off a sacred plaque of prophecy or used plain old common sense, someone, probably someone in Spektazuma, decided that the Monument of Izzatal needed protection 24/7. Hence the City of Klodorex was born! Here’s the best part. I just established that the Monument of Izzatal is commemorating a legendary figure who died a heroic death struggling against impossible odds. That is what my fluff pieces are frequently known for, so it would make sense if Klodorex Skinks and Sauri would leave and breathe (and die) by this ethos. On more practical level, my stories always assumed Dark Elves raiders were disproportionately common in and around Klodorex, now I have a readymade excuse. It’s very easy for Dark Elves to find. It’s a relatively short distance from the Reeking Mire and therefore a relatively short distance from the “Great Fire Water” where the Burn Face Tribes dwell, so I can explain why Klodorex has to deal with them but other Lizardmen generally do not. Looking at the map the Monument of Izzatal is at the intersection two mystic ley lines. That could mean that the fluff writers intended for the Monument to be built before the Great Catastrophe in order to harvest these ley lines. In this case, Izzatal could be intended to be the name of an obscure Old Ones. Too bad GW writers! If that was your goal you should have written something earlier! The intersection of ley lines still works for the fluff I came up with. If a Slann wanted to make a heroic last stand against the forces of Chaos, he or she would probably choose an intersection of ley lines for better control over the Winds of Magic. The Slann (plural) would not have needed of a physical monument or temple at that ley line intersection before the Great Catastrophe because there was no reason to. It was only after Izzatal’s death that the First Children of the Old Ones made any major construction there. Okay, so I’m pretty happy about making Izzatal a venerated First Generation Slann and the nearest official Temple City is Spektazuma, probably makes sense to say that Izzatal was the former lord of Spektazuma. Here’s a question I’ll open to discussion. When Izzatal made his/her heroic last stand was he or she A) trying to prevent the Daemonic hordes from reaching Spektazuma or B) rallying the surviving refugees from a ruined Spektazuma? Option A would probably leave Spektazuma with less horrific damage but Option B does not mean Spektazuma is just a pile of rubble. If Izzatal got most of the people, relics, and treasures evacuated, the Deamons would have probably pursued the refugees instead of tearing up the buildings. Even if Izzatal killed 90% of the Daemons in the area, 10% of the Daemons could have done a lot of city damage. Spektazuma is as ruined or intact as stories demand it to be. Now it would be sad, but Spektazuma could have been saved from Daemons only to be ruined by Skaven centuries later, but that’s depressing. More importantly we already have Quetza and Chaqua as prominent examples of Skaven casualty cities. Not every “ruined” Temple City was leveled by an enemy. One possibility is that Spektazuma was not destroyed, but the Lizardmen could have willingly abandoned it. Klodorex suffers more attacks so they would depopulate the city as they funnel troops, Slann, and support staff to back up Klodorex. Not sure though. Spektazuma is pretty close to Lustria’s west coast so it would probably take its fair share of warmblood raiders. By the nature of geography, I cannot ignore Spektazuma for long or new plot holes will develop. That about wraps up things as far as my fluff pieces and the map go. Just testing you. South of Spektazuma, east of the Monument of Izzatal in the unnamed featureless patch of jungle far away from any ley lines. Where is the ruined Kahoun of Yalthera? Good call, I almost forgot about this one! While a contingent of Klodorex Lizardmen went there, this one is very far away. Find the ley line on the map connecting Quetza and Chaqua and follow it northwest. Yalthera is located on the ley line roughly halfway between Chaqua and the River Amaxon. I figured that ley line makes a logic path of destruction for Skaven despoilers to take during the big Rat and the Serpent event. Yalthera is almost the dead center of Lustria now that I look at it. If the Skaven were able to cross the river and follow the ley line some more they would have hit the Lost City of Quit'ttax, the City of Scales. Quit'ttax is another official canon Temple City with no fluff written about it. Presumably it was ordered to be abandoned by the Slann when they realized the unnecessary apostrophe was a deviation of the Great Plan. We'll let another fluff writer fill in the blanks there. They could have been hit hard by the Skaven but I figure the Skaven are opportunists and like going after easy targets. Crossing the world's most dangerous river is not something they would enjoy doing if they could avoid it. Anyway Lord Renliss keeps himself and his minions on the move a lot. Yalthera is the closest thing he has to a home base though. Hope this inspires you in your own fluff. You can jump start a lot of ideas by looking at a named map feature with no background and decide okay, "I will complete the missing background information!" Why is the "Forbidden Jungle" forbidden? Who or what dewells in the "Caverns of the Great Bat"? Where did the "Pox Marsh" get it's name from, aren't all marshes filled with poxes? History is done without spoiling my fluff pieces. If spoilers are not a big deal, I can elaborate on the history substantially. ~means approximate. The bold face events are canon according to the Lizardmen army book, included just for a point of reference. ~4800 Before Sotek Izzatal sacrifices himself to destroy many Daemon at the ley line intersection at Mount Klodor. It just so happens that four of the most prominent demon lords banished in this event were Korshalork, Darfiel, Thazerick, and Locklirist. ~4000 Before Sotek High Elf explorers see the Golden Mountain (aka the Monument of Izzatal) on top of Mount Klodor. They attempt to retrieve it but turn back and return to Ulthuan after being subjected to the natural dangers of the Biting Bogs. Survivors eventually make sure the "Golden Mountain" finds its way onto every elven map of Lustria. ~50 After Sotek Turochlitan takes on its first human settlers. ~60 After Sotek The Kahoun of Yalthera is irreparably destroyed and tainted by Clan Pestilens. ~100 After Sotek An avatar of Sotek appears, seemingly obliterating the Skaven as they attempted to flee east. ~1000* After Sotek A tribe of savage orcs and goblins dwelling in the Reeking Mire names a geyser their new Warboss in perpetuity. ~1850* After Sotek A Storm of Magic attracts a large invading army of Dark Elves which is defeated in an event known as the Scouring. Shortly thereafter, all the Slann of Klodorex disappear without a trace. Skink priests hide this for almost two hundred years. *=I may change this time, but if I change the time, they will all change in unison, such as all advancing 500 years or all advancing 200 years forward, etc. I kind of really want one or two of my characters to participate in the End Times (that would require adjusting events by about 700 years), but I'm not sure if I want to push up the Doomsday Clock on my fluff universe like that. Before the Great Catastophe, Klodorex was basically an afterthought for the Old Ones. The Old Ones directed the Slann to build a small temple at the mountain top to harness the ley line if needed. The Old Ones consecrated a small number of spawning pools using the ley line’s energy and directed those spawned there to maintain the temple and then let it alone. They were basically an outpost of the nearby Temple City of Spektazuma and a pit stop on the way to visit the Wellsprings of Eternity and the Pillars of Unseen Constellations. There were no Slann dwelling there older than the third generation long term, even at a time when the First and Second Generation Slann were relatively common. The first generation Slann Izzatal never lived in the area, but he chose this intersection of ley lines to make his stand against the Daemonic hordes during the Great Catastrophe. He willingly sacrificed himself to call upon the full power of the ley line intersection to obliterate massive numbers of Daemons. The remnants of Izztal’s army and the remnants of Klodorex’s denizens battled the remnants of the Daemons. Every original building was reduced to rubble leveled and most of the Lizardmen here were killed. The defenders barely saved the spawning pools from being irredeemably corrupted. The survivors were five Slann and roughly two dozen Skinks a couple Sauri who would go on to become Old Ones. Three of the Slann were original caretakers of Klodorex, two of them were some of Izzatal’s lesser lieutenants. One of the new Slann, Laershin opted to stay in Klodorex and help rebuild it. The three other permanent Slann residents where Merastar (the only one of the Third generation and their default leader), Desserex, and Name Pending. Like everywhere else, the Slann of Klodorex focused on rebuilding. The first thing the Slann needed to do was stabilize the ley lines which were damaged both by the Daemonic attack and by Izzatal overtaxing it. They supervised the construction a monument and enchanted it to stabilize the ley lines. It was also magically warded against Chaos. After all that, the magical power at the ley line intersection was then diffused four directions into four Temple identical temples spaced evenly around the monument. The Monument is fashioned to look like the head of Izzatal (so you know, it looks like every other Slann too). It’s also gold plated which of course will cause problems later. A few Temple cities contributed new immigrants. Klodorex picked up some refugees from ruined cities and Kahoun. Their numbers also swelled as the spawning pools began producing new Lizardmen far more often than in the Time Before. While Lizardmen encountered the other races very seldom during appropriately named the Age of Isolation, Klodorex was even more isolated than most. Be it mighty Slann or lowly Skink, not one of the First of Klodorex laid eyes on a warmblood for the entire Age of Isolation. Slann are not prone to gossip or sniping but later some Slann have said that Klodorex’s double dose of isolation led to Merestar’s naivety about the Prodigal Races. Unbeknownst to the Klodorex’s denizens High Elf explorers had spotted the gold topped mountain that is the Monument of Izzatal. Dozens of High Elves tried to mount an expedition to take the gold and would have certainly been killed to the last man by Lizardmen if they got anywhere near the mountain, but they turned back and returned to their ships after suffering heavy losses to disease and wildlife in the infamous Biting Bogs. Unfortunately, the Golden Mountain as they called it was now on every Ulthuan-made map of Lustria. This happened well before the Elves’ civil war, so that meant the elves that would go onto become the first Dark Elves also had the Golden Mountain on their maps though it would be many centuries before they gave it a second thought. Quetza is where the Skaven first gathered strength in Lustria. Klodorex is pretty far from Quetza. Also the Skaven were generally interested in killing as many Lizardmen as possible and Klodorex only had a few thousand inhabitants. They were not especially interested in stealing magic or gold. That’s not to say that the Skaven never threatened Klodorex. While the biggest Skaven armies focused on attacking or poisoning the largest temple cities, Skink patrols from Klodorex ended up skirmishing with Skaven expeditionary forces on several occasions. As the greater threat of Clan Pestilens grew more and more obvious, more and Lizardmen from Klodorex volunteered to join Tehenhauin's growing army. I may write a piece about one or more of Klodorex’s army volunteers during this time, but it’s not a priority because everyone knows how it ends: Sotek wins. Most of the Slann were dismissive of Sotek’s prophecy altogether or at least thought that Sotek was overblown and should be accepted carefully. Merestar went even farther and ignored it altogether. Long fascinated with the potential of the Old Ones younger Children, Merastar read portents about events happening a world away. His thoughts and senses were almost literally a world away as he watched in awe as the lowly humans took the sign of the two-tailed comet as inspiration and scored astonishing victories against Chaos. Those who have the time and knowhow to contemplate on the inner motivations of a Slann there are two ways to look at Merestar’s action during the Time of Sotek. One theory is that Merastar was naively oblivious to the Skaven threat by ignoring it. Another theory is that Merestar was acutely aware of everything going on, and he chose to build Turochlitan while the other Slann were distracted so none of the elder Slann would stop him. Either way, when Tehenhauin was driving the Skaven out to sea far to the south, there were already humans in Turochlitan. The Slann of Klodorex attended the Great Convergence in Itza where all of Lustria’s Slann discussed what to do about the new god on the scene, but Merestar and his lieutenants barely paid any attention. All of my fluff pieces are set during the Age of Strife. I’m not sure how to write this without spoiling all my pieces including at least one WIP piece. I guess in broad terms. Klodorex fights many enemies during this time period, but this rarely involves massive pitched battles. Klodorex fights minor Dark elf armies often. During a localized Storm of Magic, Klodorex won a massive pitched battle against a comparably sized Dark Elf force in a battle known as the Scouring. While there were plenty of losses, this was a decisive victory for Klodorex and no organized Dark Elf force had been sent against Klodorex since. Since the Scouring the greatest single threat to Klodorex was the Vampire Lord known as Renliss who along with his sire was defeated at defeated and repelled by the army of Klodorex at great cost, though the Slann and their Skink priests were able to magically keep him in check. The Orc and Goblin tribe known as the Burnface Tribe has long been a thorn in the side of Klodorex but rarely did they mount a serious threat. The Burnface Tribe was decisively defeated by both Renliss' undead forces and then later by Kaitar's cleansing campaign. The Skaven have set up small secret lairs somewhat near Klodorex but their low numbers have left them as a local nuisance more than a local threat, especially after Kaitar's cleansing campaign destroyed their main lair. Not long after Kaitar's campaign, the Slanneshi sorceress known as Adrianne led the first army of Warriors of Chaos to ever threaten Klodorex. Despite receiving assistance from the vampire lord Renliss, Adriene's grand southern army of Slaanesh was destroyed. With the Chaos defeat, Renliss remains the sole serious threat to Klodorex though he seems reluctant to force a confrontation. My fluff hasn't gotten this far yet, but to be honest I sort of merge this with the Time of Strife. Merestar is of the third generation. Desserex is of the fourth generation. Laershin and Name Pending are of the fifth generation. My work in progress pieces are all working on new Slann characters. Now that Klodorex is the linchpin for all communication between Lustria and the Southlands, new Slann are going to be stopping by soon. Between the start of the Age of Isolation and the End Times, I figure Klodorex Sauri population tends to fall between 400 and 1000. Without going into specifics, assume the Saurus population takes a hit after every big battle and is periodically boosted by spawnings during peace time (though Saurus Spawnings tend to be followed shortly by major battles). In my fluff pieces, regular Saurus warriors tend to die at a faster rate than Temple Guard, if only because the Temple Guard generally sit out of battle where Slann are not involved, and since The Orphaned Temple City was about the Slann not being around, and had more battles than my other pieces, the Temple Guard sat out of a lot of battles. I figure at the end of Legacies, Klodorex has about 500 Saurus, about half are Temple Guard, half are regular Saurus Warriors. Given their disproportionate losses during my fluff pieces and that I never wrote in a new cavalry spawning or recruitment drive, as of Dead Water Klodorex has fewer than ten Saurus Cold One Riders. I am famous for killing characters but I really killed my cavalry men in droves in my fluff pieces. This has nothing to do with the fact that my large model collection have very few assembled Cold One riders. Klodorex has a shortage of Saurus leaders. The only Old Blood I ever included from Klorodrex was Ralesk who died during Count Renliss’ Journey to Lustria. The Daemon Lord Darfiel went out of his way to kill the most powerful Saurus he could find, so far my fluff canon only has two Eternity Wardens alive (whom I should probably name) and one Scar Veteran, Nurak. If I want to I can retcon that the temples were holding an Eternity Warden or two we didn’t see, or that another Scar Veteran was participating in the battles, who wasn’t important enough until now to be named. I could also elevate a few Saurus Scar Veterans from the rank and file given that my Sauri have fought a lot of nasty battles. Once Nurak finishes breaking in his Carnosaur, Bone Cracker, I will probably elevate him to Old Blood status. I figure the population is more stable. I respect differing opinions, but I believe that Skinks can die of old age. I figure even outside of wartime, Lustria is dangerous enough that Skinks don’t get to die of old age very often. As an extension, I believe a business as usual Kahoun or city would produce new Skink spawnings at a replacement level rate. I figure Klodorex usually has 4000 to 6000 Skinks at any given time. I figure there would be roughly one Kroxigor per twenty Skinks, but not every Skink spawning has Kroxigor in it, so a single mixed spawning would have about dozen Skinks per Kroxigor. So we are talking 200 to 300 Kroxigor. About a two thirds of Skinks are worker caste and the remaining third is split roughly evenly between beast and Sotek caste Skinks. Maybe the Sotek caste is slightly bigger than the Beast caste. That’s not to say worker Skinks cannot fight and the other Skinks cannot work. In a Kahoun of about 7000 total people, everyone pitches in with all tasks by necessity. Klodorex follows my model collection. Worker Skinks are light blue and when they fight they usually form big cohorts supported by Kroxigor. Sotek Skinks are light green and they form my Skirmisher teams. Beast Skinks are dark green and they fly my Terradons, goad my Salamanders, ride my Stegadons etc. I figure since beasts have a lot of upkeep, they would do a lot of behind the scenes works. That’s why fluff Klodorex has proportionally far more beast caste Skinks than my actual model collection. Sotek Skinks don't get away without doing civilian work either. While, they are warriors first, Sotek Skinks are also the primary hunter/gatherers since they are out in the jungle a lot. I figure Klodorex has about one Skink Chief or Skink priest is spawned per 100 ordinary Skinks. They live longer than regular Skinks aging wise, but given that they are forefront of battles and major events, they also die more premature deaths so there is usually about 50 such Skinks at any given time. I’m figuring there are probably between thirty and forty Skink priests at any one time. I figure Heavens aspected Skink priests probably outnumber the Beast aspect Skink priests three-to-two. I figure worker caste Skinks would get proportionally fewer Skink Chiefs so they three castes would have roughly the same numbers of Skink chiefs amongst them. While Skink chiefs and priests are marked for leadership at the moment of their spawning, I figure the Skinks would have some elders that are sort of on the level of Skink chiefs just from their age and experience. Maybe another 50 to 100 Skinks would qualify as respected elders and hold positions of leadership though age and experience, not birthright or innate aptitude. Note that Gerlit, the bumbling neophyte, in Orphaned Temple City has become a wizened elder in Divided We Fall roughly 50 years later. Klodorex has a widely variable Chameleon Skink population, frequently this number is zero. Their historical peak was probably fifty at most. After the events of Legacies, Klodorex has about thirty Chameleon Skinks. I figure as of Legacies Klodorex has about roughly a half dozen each of Stegadons, Razordons, and Salamanders. Maybe one or two Bastiladons, one Carnosaur (her name is Bone Cracker), about a dozen Cold Ones, 2 horned Ones, two dozen Terradons, about 400 to 500 llamas. No ripperdactyls or Troglodons. Klodorex never had a Troglodon. Ripperdactyl riders come and go. This is plenty to keep a thousand or so beast caste Skinks busy, especially since they are also attending most of the insect hatcheries, guinea pigs, huagerdons and all the other lesser animals. So the Monument of Izztal sits at the summit of mount Klodor. Four temples and numerous support buildings were built around the monument. The actual Kahoun of Klodorex is built at the base of the mountain on the western side. For some sense of organization, I'm splitting the guided tour of tour of Klodorex by district. I haven't set this in stone yet (pun! ), but I figure Mount Klodor is about 5,000 meters/16,000 feet all. The spiritual center of Klodorex is on the mountain top. The city’s Slann directed the carving of the mountain top into an image of Izzatal’s head. It was then plated with gold and enchanted by four Slann to anchor the ley line against further Chaos disruptions. The monument is big enough that it’s visible from hundreds miles away on a clear day. A lot of warmbloods think the whole shiny orb on top of the mountain is solid gold, and therefore is the largest single source of gold on the planet. It’s not, but there is enough real gold in the plating that if invaders got that far and had time to scrape it all off and get away with their loot, they would certainly be rich as princes, albeit princes of small realms. If the Lizardmen could somehow communicate that their monument is only gold plated, they would probably cut the number of invaders down by half. Below the Monument are four unorthodox temples. The temples are unorthodox because they are not pyramids. They are carved into a side of the mountain, so they didn’t need to be built into a pyramid to gain the height to use the ley lines. They are built along the ley lines evenly distributed around the Monument of Izzatal in the northeast, northwest, southwest, and southeast corners of the mountain top. If four Slann occupies all four temple roofs at once, they can harness the ley line’s full power. Given that the city only has four permanent Slann residents it’s exceedingly rare for the Slann to unlock the ley line lines full power. This has only happened three times. Once when the temples were first finished to anchor the ley line and to fortify the temples’ mystic defenses. The second time was with two foreign Slann visitors helping. The harnessing of power was merely to assist Itza in summoning the largest hurricane in Cathay’s recorded history to trash their would-be invasion fleet. The third time occurred after the events of Divided We Fall. Even a single Slann on one platform can access much greater magic than he normally access. Skink priests can access the power of the platforms too. Generally Skinks just use the platforms singly as a minor aid to their divinations, but Skinks mages can and do access greater power, especially if they work in concert. Four Heavens priests can summon and direct massive storms. Four Beast priests can seize control of all the local fauna within miles. Even one or two Skink Priests can greatly augment their normal spells. Skink Priests are not the natural magical channels that Slann are and they risk severe injury or death with the slightest mistake while directing the ley lines’ energies. Even if everything goes right, Skink priests have claimed it feels like they aged ten years in a day. Skink scribes can back this up. Naturally the lives of each and every Skink priest is documented in great detail. Generation after generation, scribes have calculated that each time a Skink priest access the full power of the temples, they will shorten their natural life expectancy by about twelve years on average. The ley lines are not picky. If a sufficiently powerful non-Lizardmen wizard were to gain access to one or more of the temple roofs they could harness a lot of mystical power. Since Skinks are not the most impressive wizards in the world, an Elf or Skaven wizard could probably use the power easier than a Skink could, assuming they could bypass all the defenses. Just like the big shiny gold orb attracts looters, the magical emanations from the Monument can be sensed by any wizard that gets within a few miles of it, and some have schemed to seize the magic, not the gold. Stealing the magical power of Klodorex is not on the to-do list of most major magical despots, but if you poured through the dusty libraries of the High Elves, Dark Elves, and Skaven seers, you would eventually find an obscure reference to Monument of Izzatal and the mystic power there. The few times one of the Lizardmen’s enemies have made a play to tap the magical power, their plan was usually to decimate the Lizardmen armies, then seize the magical font. Of course there is concern of the opposite tactic. In theory if an enemy seized control of the ley line’s magic they could then attack Klodorex and decimate their populace using their own mystic ley lines against them. The ley lines themselves do not play favorites. Anyone could use it in theory, but the Slann put in a massive ward against Chaos. The problem is that it’s a ward against Chaos, not a ward against enemies. If the Daemons came in force equal to the time of the Great Catastrophe, the Slann figure the Daemons can break the warding in about week if no one interrupts the Daemons and the Daemons were willing to sacrifice hundreds of minions to do it.. If one or two Daemon gained access to the Monument of Izzatal by stealth, let’s say Darfiel and Thazerick, it would take them a lot longer to overcome, assuming the warding didn’t destroy them outright. The less influenced by Chaos a wizard is, the less the warding impacts them. Let’s say a High Elf wizard somehow gained access to one of the temples determined to use the magic to help the forces of Order, in the ham-fisted clumsy way that Prodigals think they are serving Order. The warding would probably cause a nasty headache and little more. A Skaven would have a much harder time than a High Elf but a much easier time than a Daemon. The Slann are painfully unsure of how well their warding spell would impeded a necromancer vaguely familiar with Slann magics cough cough Renliss cough cough. I’m pondering past events where a wizard makes a direct play for the Monument of Izzatal. I’ll will keep them to myself for now in case I want to write a short story on these later. In response to some of these attempts, the Slann have considered widening their ward to repel more types of hostiles than just Chaos, but they are concerned that if they widen their magic ward’s effectiveness against more types of hostile magic, this will at least slightly weakened the ward’s effectiveness against Chaos. When the Slann have to consider two choices with severe trade-offs, the result is usually centuries of pondering. Considering how well defended the temples are, they make a good place to store valuables. The Slann and their top retainers don’t share details the specific contents of the temple vaults with their underlings. It is assumed that Klodorex is not keeping any golden plaques. The Old Ones never decreed any plaques be stored there before the Great Catastrophe and given the number of would-be looters the Monument of Izzatal attracts, it seems foolhardy to relocate golden plaques there, or so say the Slann of the Big Four…not that they trying to deny Klodorex access to sacred plaques as a political power play or anything… A few city denizens whisper that some plaques were relocated to Klodorex during the time of the Rat and the Serpent because the Skaven never made attacking the northwest corner of Lustria a major priority, but even if that was the case, they were almost certainly relocated again after the crisis passed. Rumor is that Izzatal’s remains are locked in one of the temple vaults. While some Lizardmen temple cities occasionally take relic priests into battle, no one has seen Klodorex do this with Izzatal. There is whispered debate whether it’s a few preserved bone fragments or a full mummy. No one but the Slann and know which temple Izzatal’s remains are in. They won’t even acknowledge if any of Izzatal’s remains are present. It is known that the temple vaults hold at least one or two mummified Slann, but these were Slann of later generations that happened to die during the Great Catastrophe in Izzatal’s service. Relative lightweights as Slann go. Renliss’ own heart is magically sealed within a ceramic jar as a means of influence over him. For all their magical power, the four temples surrounding the Monument of Izzatal are pretty small in size. They don’t have to space to accommodate large numbers of visitors or many frills. Slann can receive more luxuries and pampering from simpering underlings ground side, so if they choose to rest between activities they usually do so at the bottom of the mountain, not on top of it. Also, if a Slann is interested in actually running Klodorex, it’s a lot easier to do so when every missive and report doesn't have to to be ferried up or down a mountain. Slann do not need to perform godlike feats every day, so if they don’t need the extra power of the ley lines every day. Recently, since the Monument of Izzatal became the proverbial radio antennae allowing telepathic contact with the Southlands Slann, they usually try to leave at least one Slann on top of the mountain most of the time. One Slann on the mountain top can receive messages from the Southlands and relay it to Slann below the mountain. Only Slann on the mountaintop can contact the Southlands, but since a single Slann on the mountaintop can telepathically link with any Slann on the bottom, this is an easily circumvented limitation. While I’m covering the mountaintop I will address the implications that higher elevations are cooler than lower elevations. Lizardmen don’t do cold, is this a problem for them here? No it's not a problem. The upper levels of the mountain are cool enough to be uncomfortable, but it is not cool enough to be dangerous. Also the Slann renew an enchantment every five hundred years or so to funnel a tiny bit of the Monuments magic to heat the four temples and the sleeping quarters near the temples where their Temple Guard and most trusted retainers stand vigil. More Room at the Top! So I established that four closely linked temples around a giant golden head of a dead Slann surrounded by four temples to harness the mystic power of two magic ley lines, but not many people are up there. Where are the rest? The vast majority of the Kahoun’s denizens live and work at the base of the mountain or near it. That means they need some means to traverse the mountain. Most of the city is set up along the mountain’s western side. The easiest way to get up the mountain is to fly. Since most people don’t have a trained Terradon or magical flying palanquin, there are three ways up other ways up: take the stairs, take the switchbacks, or climb the mountain the hard way. The fastest way up the mountain is to take the stairs, affectionately known as the Temple Stairs (Skinks tend to name things literally). A single set of stairs was carved into the rocky portions and bricked over the loose dirt portions of the mountain. The Temple Stairs are wide enough for a single Kroxigor to climb safely while running. Just for reference, Mount Klodor does not have a uniform slope so the stairs are not perfectly uniform grade either. Some parts are steeper than others, there are even small parts where the steps go down or are level. There is a paved road leading from the city’s literal center to the stairway to the city’s spiritual center. Naturally the denizens want to make ascending the stairs easy for Lizardmen and a suicidal climb for the enemy. The first line of defense is that enemy’s have to get to the base of the stairs. An enemy would have to sneak or fight their way through a small fully occupied temple city assuming said enemy is strong or wily enough to even get to the city outskirts. There is a gap in this first line of defense in that an invader could choose to skirt around the city limits, climb the base of the mountain and then begin ascending the stairs once outside the city limits. The limitation is the mountain base has been terraced by the Skinks and Kroxigor for farming. By design all the crops nearest to the stairs are root based crops like potatoes that don’t grow very high above ground. The area is patrolled a lot both on ground and by aerial patrol. Anyone trying to sneak through potato fields is going to have very few things to hide behind and likely to get spotted unless they have some amazing stealth power on par with Chameleon Skinks. When space permits, there are stone buildings near the stairs erected with bricks or carved into the mountain side. These stone buildings are usually stocked with a modest supply of food and water and can provide safe, if fairly Spartan accommodations to rest if the Lizardmen want to stop to sleep, or just take a quick break from climbing all those stairs. The stairs go right through most of these buildings. If a non-Lizardmen invader gets to one of these shelters, think of them as a gate house in a medieval castle. They are flanked by fortified towers for archers and javelin throwers. Someone makes it inside and the Lizardmen don’t want them in, you should do some quick reading on murder holes. Now picture what a murder hole would be like if it was manned by the most ruthless skilled poisoners in the world. Murder holes become slaughter holes. This is the second line of defense. Just like the first line of defense, an invader could take the stairs most of the way, then start climbing the mountain and swing wide when nearing a gate house. As much as possible, the gate houses are placed in the steepest most treacherous areas making this a dangerous proposition for all but the most skilled mountaineers. On top of this, there are Skink made booby traps and carefully tended poisonous thorny plants in the areas surrounding the gate houses. These areas are patrolled by skirmishers who know exactly where the traps and hazards are and where they are not. They know where the hard cover and hiding places are. Their usual hit-and-run tactics with short run poisonous shooting is even more brutal here. Fighting them here is only slightly less dangerous than trying to sprint through the gates houses and take one's chances with the murder holes. Once the elevation gets tall enough that the vegetation gets noticeably thin, the stair climber is now pretty close to the four temples. One will encounter will encounter a cluster of several buildings, colloquially called the Guard District. Some of the buildings are there to store supplies the Slann may need. Even if the Slann aren’t present, the supplies remain stocked because the Slann could decide they want to ascend the mountain any time. There are sleeping quarters and supply storage for Skink support and barracks and a small armory for the Temple Guard and other mountain defenders. The third line of defense guarding the temples is the Temple Guard. At a bare minimum (when there are no Slann up there) there are about two dozen Temple Guard and a dozen warrior Skink skirmishers guarding this area. Maybe a half a dozen civilian workers maintain the site and there is usually a supervising Skink priest, usually verses in Heavens magic rather than Beasts. There is an alcove for Terradons and at least one fully rested Terradon rider is rotated in at all times so messages can be delivered quickly down the slope in the event of an emergency. On the opposite extreme if say there is a Slann in each temple there are probably going to be roughly two hundred Temple Guard present with at least a hundred armed Skinks providing support, a half a dozen Skink priests, and at least three alert Terradon riders on stand by. Assuming the person who climbed all those stairs is a lizard and not a warm blooded invader, you can bet the guards are going to ask why the lizard climbed all this way. Actually it doesn’t matter if the lizard climbed the stairs, climbed the mountains, took the switchback or flew on a Terradon. If you are not a Slann, before climbing any higher you need permission from whomever happens to be manning the Guard District, or the best he can hope for is to be bludgeoned to unconsciousness by the Temple Guard. With regard to the third line of defense, the solution is similar to the previous two. Go around the Temple Guard. First off, any Saurus or Skink on this level of guard duty is expected to know the mountain well enough to walk it blind folded. Second off the third line of dense is augmented by a fourth and final line of defense: magic. There is a passive magical hex on the upper areas. Anyone entered the warded area with hostile intent has their chance of accidentally miss stepping on a rock and either injuring themselves or making a loud noise. If a Skink priest is occupying one of the temple platforms and is actively on lookout, he can extend his mystical senses he can sense where all large life forms near and tell what species they are (Skink, Kroxigor, Human, Skaven etc). This is such a minor use of the ley lines power that it poses negligible risk to the risk to the Skink. Of course, a threatened Skink can draw upon the temples magic more deeply to smite enemies with lightning. Another trick any Heaven Skink priest on guard duty is taught is how to modify the Ice Shard blizzard spell to turn the stairs from a convenient egress to a slippery death trap. Four Skinks occupying the platforms can theoretically coat the entire stairway top to bottom if they pull on the ley line’s full power, though they’ve never actually faced a threat dire enough to cut off the entire stairwell. This is all without any Slann involvement. A single awake Slann accessing the Monument of Izztal's power can probably thrash a hundred foes by waving a finger at them. The west side of the mountain is crisscrossed by switch back trails. Rather than going straight up the mountain, the switch backs go up the mountain diagonally to make the climb a lot less steep but a lot longer. It’s not as fast, but it’s less physically taxing to climb than the stairs. Most stair climbers only take a little food and water with them. If you are carrying full military gear or a bunch of supplies to restock the guard center, the switch back trails are generally more practical than the stairs. The switch back trails are wide enough that a unit of Saurus Warriors (or more likely Temple Guard) can easily traverse it in full formation deployed five wide the entire way up with only very occasional bottle necks. It’s wide enough (barely) to accommodate a fully loaded Stegadon with supplies, but generally bulk supply deliveries are handled by Kroxigor porters. If a Slann is unwilling or unable to activate his magical floating palanquin, the switchback is plenty wide enough to allow Temple Guard to carry their lord’s palanquins (and their lords of course) up and down the mountain if need be. If any invading force wanted to ascend the mountain by brute force, the switchbacks are a better route than taking the stairs assuming the army includes monsters, cavalry, war machines, or other non-infantry elements that would be hard to lug up stairs. Stealth would be hard here because the paths are kept well clear of vegetation and Terradon riders regularly keep close watch on this path. There are several guard towers flanking the path at periodical intervals. These are usually not manned, unless Klodorex is on high alert. There is a lot of artificially constructed and naturally occurring hard cover near the paths. Any invader trying to use the switchback should expect a lot of ambushes by skirmishing Skinks and their warbeasts. Now imagine being constantly shot at from your flanks by near uncatchable foes while a bunch of Saurus are marching down on you from the switchbacks. Makes the stairs seem more reasonable. The switchbacks of the Temple Trail intersects with the Temple Stairs in many places. These intersections are the mostly likely places to have guard towers, selectively arrayed hard cover for Skink skirmishers, regular patrols and every other defensive element of Mount Klodor. Because of the overlapping defenses an invader that is trying outwit the defenders by switching between the stairs and switchbacks is going to be in for a hard time. The east side of the mountain has its own set of switch back trails called the Chameleon Trails. They are steeper, and more treacherous. The Chameleon Trails are hidden both my mundane foliage and a bit of illusion magic. Taking the Chameleon Trail is only marginally easier than actually climbing the mountain but it was built for a last resort scenario not for everyday use. If the Monument of Izzatal actually fell to invaders, then presumably all the defenses on the west side of the mountain were exhausted, a unit of Temple Guard could quietly carry a comatose Slann east side of the mountain. Also, it can also be used to let reinforcements march in from Spektazuma or Tlanxla if needed. The First of Klodorex are not naïve about the east side. Just because most of their enemies usually attack from the west doesn’t mean the east is left unguarded. They also don’t assume that the Chameleon Trail is impossible for enemies to find. The Chameleon Trails do have some concealed fortifications for defenders and there are aerial and ground patrols on the east side of the mountain, just not nearly as many active defenders unless long range scouts have reported an army in that direction. Then you expect Klodorex to answer with its own army rather than risk letting the enemy reach the mountain. As a side note, Klodorex does not keep many Ripperdactyls, but when they do have Rippers, they like to nest them on the east side of the mountain. That way they are close enough that they can be summoned if enemies are near, but if enemies are not near, it’s best to keep the Rippers away from the population center, so they don’t eat any of the townsfolks' livers. Climbing the mountain the hard way is certainly possible. As mountains go in the Spine of Sotek, the Peak of Xholanka is neither the tallest nor the steepest. You don’t need to be a brilliant mountaineer to climb it, just a competent mountaineer. If the climber is traveling light and in decent physical shape, they don’t even need any special climbing gear. If you are climbing with heavy armor and the full gear load of a typical professional soldier, you are going to want climbing gear. It’d be a legendary feat to sneak an whole army up the slopes this way but scaling the mountain the hard way is the best way to try to take the mountain summit through trickery. I hear @Y'ttar Scaletail scribbling notes down. If the army climbing the mountain the hard way includes war machines, climbing the mountains is near impossible and is certainly not possible to do so stealthily. Certainly no one is taking a Doom Wheel up the mountain the hard way. Lizardmen sometimes opt to climb the mountain too because climbing the mountain is hard. Some climb the mountain for fun. Some of the mountain competitively. Skinks, Sauri, and Kroxigor often make a contest of it to see who can climb the most difficult stretches of mountain the fastest. If one of the First who does not hold high social rank decides he wants to visit one of the temples to worship at (instead of visiting a less restricted ground side temples), the guard are not likely to let him into a temple unless he physically climbed the mountain the hard way. In its own way, the difficult climb is seen as an act of devotion to the Old Ones in and of itself. It shows dedication and sincerity for the one making the pilgrimage because it’s hard. The city’s leadership encourage recreational, competitive, and spiritual mountain climbing. Mountain climbing is good for building strength, agility and stamina. Beyond that, the military leaders are aware that they may have to fight Daemons, Skaven, or who knows what else on the mountain slopes someday. The more the Klodorex’s denizens know about the nuances of the mountain, the better they will able defend the mountain. Any Skink or Saurus assigned to guard duty on Mount Klodor will periodically be ordered by his superiors to scale the mountain as part of a training regimen, and they are ordered to never use the exact same route up the mountain twice. Also called the Temple District, the City Center Is a walled area encompassing every spawning pool and the most important temples (other than the mountain top temples obviously). Note the 8th edition Lizardmen army book talks about temple height being linked to a Slann’s height and the elder Slann use their relative height on pyramid tops to avoid the thoughts of lesser. The Great Temple and lesser temples are designed along these lines (more important temples are taller than lesser temples), but it’s not used as a status symbol or means of communication (or denying communication). The mountaintop temples are where Slann do most of their major contemplations, and the Klodorex Slann don’t mind sharing their space with other Slann much, at least not other local Slann. The Great Temple is where they do most of their mundane duties, not deep contemplation of mighty feats of magic. All the lesser temples CAN accommodate a Slann either inside or on the roof, but Slann rarely enter them. Slann can go anywhere they want and no one will question them, but the lesser temples are mostly used by the lesser Lizardmen despite having Slann accommodations. The City Center didn’t have any wall until a wooden wall was hastily erected in response to Skaven scouts being found and slain fairly close to Klodorex during the Time of Tehenhauin. The wall has been torn down and replaced with an upgraded stronger wall many times over the centuries. In fact Klodorex builder chiefs have gone far and wide through Lustria and sought out and questioned every Lizardmen they can find that reconnoitered one of Lustria’s warmblooded settlements and whenever possible questioned Skinks who actually went on campaigns outside of Lustria, so they could sketch the fortifications of Prodigal races and incorporate their admittedly superior fortification designs. The current wall is made of stone and has full ramparts, crenellations, towers with arrow slits, and hoardings. The walls are manned day and night by Skink archers and Saurus Temple Guard. Obviously there are a lot more troops on the walls if enemies are believed to be near the Kahoun, but the walls are never lightly defended. The towers are equipped with great bows and giant blowpipes. There are plenty of rocks to drop on would-be attackers. If the enemy has been sighted near the city, the defenders can be equipped with fire leeches and similar special ammunition like clay pots filled with live hornets. They can also set up an Engine of the Gods on the walls if the Skink Priest in charge of district defense believes the situation calls for it. The most lagging part of the walls is the gate. It’s a pair of Bronze doors with a wooden brace. The gates are usually open. At one point they were so rusted they couldn’t be closed. The situation where they wanted to close the gates but couldn’t turned out to be a false alarm, but the head builder chief at the time were furious that the district workers allowed that to happen. The gates are tall and wide enough to let a large dinosaur like a Stegadon or similar large dinosaur through. The gate is wide enough but the streets of the Temple District are so cramped that it is usually not worth the effort. Whether or not the gates should be made smaller for security reasons is an ongoing debate among Skink chiefs. Some argue that a smaller gate would be easier to defend. Some argue that in an emergency they’ll want to bring in heavy war beasts. Until and unless the Slann weigh in on this, the debate is likely to be ongoing. Skink chiefs are not immortal, so they have turnover, but they are usually replaced by a chief who was mentored by the previous one. Klodorex builder chiefs are notorious for being relentless perfectionists. The current builder chief is hoping that since Zlatan has allied with the Southlands Dwarfs and Zlatan is allied with Klodorex that they can somehow gain access to Dwarven engineering secrets but he can’t even try to do this without Slann approval and no Skink priest has agreed to grant him an audience with a Slann to make this request. Until recently, the largest structure in the city, the Great Temple is a traditionally constructed Lustrian stepped pyramid. Most of the city’s Slann spend most of their time in the Great Temple so it’s the city’s seat of government. When the Slann are not present, not awake, or not interested in running the city, the Skink priests run the city from the Great Temple. The lower areas have some temple vaults below ground, but most of the Temple’s interior is built to accommodate the Slann in some way. Assuming the Temple Guard let a visitor in, they generally have to wait in the temple vestibule to approach a Slann. If the visitor only needs or wants to talk to Skink priest, they can do it here. The vestibule has well decorated walls and also serves as a shrine to all the Old Ones and Sotek. The main chamber is where lesser Lizardmen can address or be addressed by the Slann. The other chambers are only for Slann, their guards, and their most trusted attendants. The Great Temple has four smaller temples off the northeast, southeast, northwest, and southwest corners mirroring the way the four mountain temples flank the Monument of Izzatal. They are not identical but they are very similar in aesthetics though the temples are much larger than their mountain top counterparts. Like the Great Temple they are stepped pyramids. The main chamber has a small fountain where petitioners can offer up prayers and sacrifices to Tzunki. There is a back chamber where Skink priests and their attendants sleep and quietly maintain the fountain behind the scenes. The extra chambers originally built for Slann who chose not to use them were eventually repurposed. Instead of housing Slann they are often filled with jugs of water from the Heart of Tzunki spring to be used in the dry season because well water isn’t good enough for Skink Priests and Slann. They get to drink water from the Heart of Tzunki year round. This temple was built on top one of the more prolific of Klodorex’s two Saurus spawning pools. As one would guess many Saurus spawnings in Klodorex often are blessed by Tzunki. Most Sauri from this pool are considered to be a bit faster and more agile than average Saurus spawning, but Saurus spawnings that enjoy the full blessing of Tzunki (fully aquatic Sauri) are fairly rare. The spawning pool is not limited to bestowing Tzunki’s blessings. Over the centuries, Sauri born of these waters have emerged with marks from most of the Old Ones as well as Sotek. Kaitar and Nurak were spawned here. Like most of the four satellite temples around the Great Temple, there are a lot of chambers built for Slann that are never used by Slann. These have been re-purposed into a trophy room. In addition to actual trophies, a lot of standards are stored here when not in used and there a room with carvings commemorating Klodorex’s military battles in brief. There is small library of scrolls that covers all these military histories in detail, and is well maintained (bored Skink scribes are ordered to recopy them often). These scrolls are not restricted, any literate First is welcome to peruse these scrolls whenever they want. This temple is built on the other one of Klodorex’s two Saurus spawning pools. While not all Saurus spawnings here are Temple Guard, all Temple Guard spawnings are spawned here. Most Saurus Warriors in Klodorex who choose the rite of Sacred Guardianship later in life originally hailed from this spawning pool. Taresh came from this spawning pool as well as every living Eternity Warden in Klodorex. Just like the other spawning pool doesn’t necessarily carry Tzunki’s blessing, spawnings here do not necessarily all bear the marks of Quetzl and tend to show a wide variety of the gods’ blessings. The Temple of Itzl in the Temple District is not the preferred place for most beast caste Skinks to worship. They prefer more accessible temples and shrines near their beast enclosures. However, If one of the First of Klodorex who does not deal with beasts on a daily basis feels the need to offer a prayer for Itzl, they will likely choose to come to this temple to it. Itzl doesn’t have a lot of formal rituals, but the few rituals that are highly formal usually at least start here (Itzl rituals are often processions). The lower levels can theoretically stable up to twelve Horned Ones. Klodorex currently only has two Horned Ones. One of the Eternity wardens used to be a Cold One rider and now very frequently rides one of Horned Ones. He’s capable of standing a still and silent vigil as well as any Eternity Warden but he is not averse to being more proactive in Slann defense when the situation calls for it. His Horned One is only ridden by him. The other Horned One, Loroq, has had many riders, and has been used by many different Skink Priests and Skink Chiefs over the centuries. The Temple of Tlazcotl is pretty austere, as is temple for structures honoring the most stoic of Old Ones. The chambers intended for Slann to mediate without distractions, are of course almost ever used by Slann, but the lesser Lizardmen do make frequent use of these chambers. They are a good distraction-free place for somber reflection and prayers to the Old Ones. It is mostly individual Saurus that choose to do this, but Skinks and Kroxigor are welcome to use these spaces if they choose. The Slann spend most of their time in the City Center, so the Temple Guard’s main barracks is located in the City Center. If for any reason, a Slann chooses to dwell anywhere else, Temple Guard can and do requisition any space they want to claim as their own, but the barracks here are where they normally stay when not on duty. The tallest non-temple structure is the armory tower. Temple Guard sleep with their weapons and armor, but the armory has plenty of spares in case their primary equipment gets damaged, and of course should a new spawning of Saurus destined to be Temple Guard emerge, the armory has plenty of weapons and armor waiting for them. The armory is not just for Temple Guard. There are plenty of weapons and ammunition for the Skinks who guard the walls to use. The roof the armory is a frequent landing pad for Terradon riders. If the gates are closed his is the only real way in and out of the Temple District. If Klodorex is ever directly threatened, or Old Ones forbid the City Center is threatened, the roof will be stocked with all the rocks on chains, fireleeches, and javelins the Terradon riders could ask for, so they never run out of death to rain upon foes. Besides the Temple Guard barracks, there are also housing units for Skink temple attendants not important enough to get allocated sleeping space inside an actual temple but important enough to warrant housing in the Temple District. The temple attendants also have their own support staff, mostly gofers (“go for this, go for that”). Another noteworthy support building is the ancillary storage unit for the Temple of Tzunki. What’s stored here? A bunch of buckets. Should a fire break out in the Temple District, then the Temple of Tzunki’s water supply becomes the basis of the fire fighting efforts. Skinks with relatively rare skills such as goldsmiths, healers, herbalists and the like often live and work in the City Center. Rounding off the space crowding building is storage units, and there is a lot of storage. If the Temple District falls under siege, they don’t want to run out of food or water. Beyond this, the Skinks go to great lengths to store copious quantities of anything they think the Slann could want or need. The Eastern District is the area between the City center and the base of Mount Klodor. Because Klodorex was built to defend the mountain, this is the oldest part of the city, and it thus has a disproportionately higher number of high value buildings than the other outlying districts. At the center of the original Beast Handler’s Quarter is square-ish pyramid shaped temple dedicated to Itzl. Like most temples outside the Temple district, this was never intended to be used by Slann. The beast caste Skinks go here to pray to Itzl for their charges to be healthy and pray to Itzl that their charges won’t disembowel them. Most Beast aspect Skink priests don’t mind less formal religious observances than their uppity Heavens counterparts, so they spend a lot of time here too and support their non-magical kin in their beast keeping endeavors. The beast handlers used to keep all their beasts in the Beast Handler’s Quarter, and naturally their sleeping areas and supply storage units were kept here too. It was assumed to be easier that way. With all the redundant buildings, there are now beast pens in other parts of the city. These were left largely unused until Kaitar’s common sense tirade gave the beast caste a wake up call. Nearly every beast they keep is territorial, so they are easier to keep if they have their own space. As much as possible, Klodoroex’s more violent beasts were separated out into disparate pens and holding areas. Almost half of the city’s beast caste Skinks now live and work in other parts of the city now. The original Beast Handler’s Quarter now is mainly the quarter for the biggest beasts such as Stegadons, Bastiladons, and the kahoun’s single Carnosaur. Directly adjacent to the Beast Handler’s Quarter is the Terradon Quarter. Terradons really like high places but usually nest on the ground. They have a lot of nesting areas in caves and alcoves on both sides of Mount Klodor and the Terradon riders know where they all are. Mount Klodor is very comfortable for Terradons, but it’s not very accessible for lowly groundlings, so they have a nesting areas outside the Klodorex city limits so the Terradon riders can maintain communication with the other First of the city. The Terradon Quarter is more of a messenger's depot than actual quarters. Besides landing areas, nesting areas, and sleeping quarters for the riders and support staff. There is a lot of storage of food and other supplies, and a small armory for sky cavalry-friendly weapons. There is also a modest temple dedicated to Tlanxla which is open to most of the city for worship if they want. Most of the Skink priests who trained in flying Terradons sleep here and nest their personal Terradons in or near the Temple of Tlanxla. As mentioned above, the Eastern quarter holds Klodorex’s temple to Tlanxla, and one of the kahoun's two Itzl temples. There is a shrine of Xhotl sits on an artificially raised hill lined up with the Monument of Izzatal. While this shrine is one of the oldest structures in Klodorex and no Lizardmen would dare move it, its religious role has largely been supplanted by the other shrine of Xhotl built later as a war memorial. Technically, the four mountain top temples are all east of everything in Klodorex, but apart from these, the easternmost temple is a temple to Chotec per tradition. Like the Temple of Tlanxla there aren’t any vaults or Slann accommodations here. It was created as an aid to pious Skinks, Sauri, and Kroxigor in their Chotec worship. The East district holds a fairly modest temple dedicated to Tepok. While the Temple of Tepok is technically a holy place, the Slann barely acknowledge it. The Slann generally use the mountaintop temples and the Great Temple to do most of their magic, so the Temple of Tepok has become a sort of casual refuge where Skink Priests and their top attendants can rest and mingle without the demands of either the Slann or their subordinates to trouble them. During actual Tepok rituals, the priests are all business, but they are surprisingly laid back here the rest of the time. Any three points form a triangle, in the triangle formed Temple of Tepok, Chotec, and Tlanxla, Klodorex built an open air coliseum like structure with raised seating called the Gathering Place. This building has the largest capacity for people (be they Slann, Skinks, Sauri, or Kroxigor) of any building in Klodorex and it can seat roughly half the entire population. While the Gathering Place can be used for casual gatherings, it’s usually used for religious gatherings. The eastern district is where Klodorex touches the base of Mount Klodor so anyone taking the Temple Trail or the Temple Stairs needs to go through here. There is a Shrine to Uxmac that most would-be mountain climbers traditionally visit before ascending to pray for a safe journey. Apart from the City Center this is the most densely packed region of the city with large buildings and critical infrastructure. There are very few sleeping quarters, storage units, or centers of industry here that do not directly cater to one of the sites listed above. The major exception is silos for harvested crops, sheds for farming implements and a few modest sleeping quarters for Skink and Kroxigor farmers. 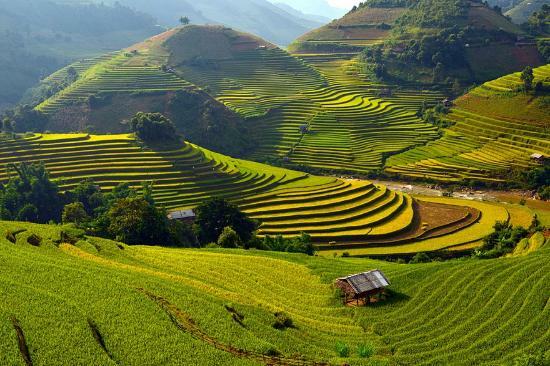 They are clustered in the eastern district because the Eastern district is adjacent to the Terraced Fields. Even so, most of the grain silos are in the south and west districts just because there is not a lot of free space in the East. Right before the Slann went missing, one of the Slann said “improve the constructions.” The Slanns’ intention was to have the repair the damage that occurred from a recent Storm of Magic, and the Slann figured this would take two or three years at most, but the Slann were gone for almost two hundred years. The Skink priests blindly kept relaying orders to build at first figuring the Slann would reappear when they were satisfied by their building. Even when they realized that the Slann were actually missing, they kept the builders building to keep everyone distracted. Most of the boondoggle construction occurred in the Western District, so while underutilized builidngs are common in most of Klodorex, the western district has the bulk of buildings that are empty or only used at partial capacity here. Because of the position of Klodorex relative to Mountain Klodor the city slopes down gradually down from east to west. The Kahuoun’s aqueducts fed by the Heart of Tzunki on the lower mountain slopes and a wide variety of rain gutters throughout the entire city flow into the aqueducts, most of which are pointing west to the reservoir, an artificially constructed water storage unit on the edge of the city near Klodorex’s main farming fields. Officially called “the reservoir”, it’s gained the nickname “Tzunki’s Bladder”, but don’t let a Skink priest hear you calling it that! If rainfall is insufficient for the crops, a release valve can tap the reservoir into irrigation canals. If rainfall is dangerously high and the reservoir is in danger of overflowing, a different valve can empty the Bladder down an aqueduct to send the excess water into the Llama Fields. If rain fall is ever so light that Tzunki’s Bladder is running close to empty, Kroxigor will be instructed to fill it with well water. They don’t even have to haul water down to the Tzunki’s Bladder since most of the aqueducts feed it, they just need to dump their water in the nearest aqueduct and the water will eventually flow to the right place. Tzunki’s Bladder was built in order to service Klodorex’s crops. It used to be on the western edge of the city but Klodorex expanded outward and the Reservoir isn’t on the direct outskirts anymore. A lot more land was cultivated for farming requiring a more sophisticated and expanded irrigation system. The reservoir also became a focal point for other buildings not associated with irrigation. Every district has its own fire control building loaded with full and/or empty water containers that can be used for bucket brigades, but the Western district has the biggest and most important fire center. Any craft that requires frequent and intense fires, especially metal forging or pottery, tends to be located near the reservoir, just in case. Likewise after the beast caste Skinks decided to split up their charges by, they opted to move most of their Salamanders to pens near the Tzunki’s Bladder, in case of accidental fires. Originally the beast pens in the Western Quarter were intended to hold a menagerie, a couple Stegadons, a couple Salamanders, a couple Razordons and a Cold One stable. The original plan was to have all their fiercest war beasts ready to guard against an attack from the west, but the day-to-day benefits for safety and convenience of clustering all the Salamanders in one place has outweighed the potential short term tactical advantage of the original plan. The Western District only has three major holy sites worth mentioning. The biggest and most obvious is the Temple of Huanchi. Per tradition, the Temple of Huanchi is in the city’s westernmost area because west is the direction of the setting sun. The Temple of Huanchi is the oldest construction in the Western district. Since the Kahoun gradually expanded in a westerly direction that means the Temple of Huanchi is more center west than far west now. The Temple of Huanchi used to have a wide open plaza that used to be the widest open space within the Klodorex Kahoun limits. After centuries of new building in the Western District, the plaza is about half the size of what it used to be. There is talk about relocating the Temple of Huanchi farther west with a new wider plaza but at the moment everyone is sick of massive building projects, so that renovation has been put off till later, if not indefinitely. The second most holy site in the Western district is the Tribute to the Fallen. West is the considered the direction of death in a vague metaphysical sense and Huanchi is the Old One most commonly associated with as a custodian to the dead, so the memorial is nearby. In a literal sense, most major battles Klodorex is involved with occur to the west, so again it’s appropriate to have the monument to fallen here. The growth of the memorial is part of the reason the Plaza of Huanchi is now smaller. The third holy site worth mentioning is the Shrine of Xapati, the Old One of Vegeance. Xapati received his first public shrine shortly after the devastating first Dark Elf attack on Klodorex, just outside the Kahoun limits. Now it’s technically within city limits. More scandalously it’s west of the temple of Huanchi, but it’s not technically a temple, it’s a shrine, so this is allowed. The building could easily house over two hundred Saurus warriors, let them enjoy heated sleeping quarters, an armory for all their gear, and a modest larder for food and other supplies, but it only ever held Kaitar’s spawning which only had fifty-nine members at their peak and about forty surviving members when this unit was actually completed. When the Slann were missing and Kaitar briefly took control of the city from the Skink Priests, the Skink priests barricaded themselves in the Great Temple and wouldn’t let anyone else. In. When that happened, this building the city’s political center as leaders met here to discuss army plans and compare notes on reports from patrols and search parties. After the Reunification, Skink Chiefs and Saurus Scar Veterans continued to use this Saurus housing unit as their military headquarters. This was originally intended as a minor insult to the Skink Priests who the military leaders believed jeopardized the Slann’s safety with their hidebound stubbornness, but this has evolved into something beneficial to all parties. The secular military leaders prefer to plan their operations without the meddling and micromanaging of the Skink Priests. If the enemy is spotted somewhere, then they will inform the Skink Priests. If all is well, they do not need to talk to the Skink Priests at all. For their part, the Skink priests actually prefer not to deal with minutia of military planning, so they (secretly) prefer the new system. This set up is good for Lizardmen who don’t hold any social rank too. Skinks and Saurus who actually work the patrols prefer the new system to because this building is a lot easier to get to this building than the Great Temple. It’s closer to the edge of the jungle where they spend most of their time, and Skinks don’t have to wait at several check points for Temple Guard to give them permission to enter and leave. There is nothing holy to defend here, so all Lizardmen have pretty much unlimited access here day or night. What characterizes the Western district is a lot of empty or half-full buildings. Most of the non-Temple Guard Saurus bunk here, as do some Skinks. This is mostly storage and sleeping quarters that lie unused. There is a small drive to begin hording nonperishable goods. This is primarily but not exclusively applied to stocking up on extra weapons. The main thing that sets apart the Southern district is the giant exposed temple and an excess of beast stables. The biggest boondoggle during the period of the Slann’s absence was a full replica of the Great Temple. It was almost finished by the time the Slann returned. When asked the Slann were asked what to do about it, Lord Laershin replied, “It’s so close to complete, might as well finish it,” so the workers finished it, but it is largely undecided what to do with it. A lot of Klodorex wanted to dedicate the temple to Kaitar, but the Skink Priests wouldn’t allow a Temple to be dedicated to a mere Saurus, so the compromise was made to ask the Slann to dedicate this temple to the Old One Xholanka, Kaitar’s patron deity and the current unofficial patron of all Klodorex. Because of Xholanka’s relative obscurity, Klodorex now boasts what is easily the most grandiose temple dedicated to Xholanka in the entire world. A large chamber is decorated with carvings depicting the events of the Reunification (aka the events of Orphaned Temple City) also called the Hall of Heroes. The Hall of Heroes has a life size statue of Kaitar, Zat-kai, Taresh, and a number of others with plans to expand the statue collection indefinitely. There is also a large interior chamber set aside as a shrine for worshipping Xholanka. Apart from the two aforementioned chambers, the Temple of Xholanka is mostly wasted space. The temple could easily accommodate multiple Slann, and it has been suggested that it could be used for visiting Slann, but there haven’t been any takers. Klodorex doesn’t get many Slann visitors. If foreign Slann do visit they either want to borrow the power of the mountain top temples, or they are coming to either help or meddle with the Klodorex Slann politically in which case they have all asked/demanded to stay in the Great Temple. There is also the problem that the Temple of Xholanka is pretty close to the Kahoun’s southern border and is fairly exposed to attackers from the south. It’s not safe enough for a Slann or an ancient treasure, at least not while there are more obvious places to put them. That said, the First aren’t going to tell invaders there is nothing of interest here, since they’d rather fight invaders here than on the mountaintop or in the main temple district. The “sacred vaults” in this temple have no treasure at all and are loaded with the best magical and mundane traps Klodorex could come up with. There are housing units in Klodorex that easily house double Klodorex population of Skinks, Saurus, and Kroxigor. Sauri are not picky, but if given a choice, most prefer to share quarters with their spawning brothers and no one else, so most Saurus units are occupied, but half empty. Most Skink and Kroxigors prefer large crowds so about half the Skink and Kroxigor units are full or mostly full while the remainder are completely empty. No one expected the Chameleon Skinks to claim one of the empty housing units, but they did. The Chameleon picked the one closest to the edge of the Kahoun near the narrowest portion of the Llama Fields for easy access to the jungle. Less than fifty Chameleon Skinks are using a housing unit intended to hold over two hundred Skinks. Most of the time, at least half of the Chameleon Skinks are outside the city hunting or patrolling, so why did they want a housing unit at all? They took a housing unit in honor of Kaitar. Their preferred method was and is to just to hide along the fringes of society and show up when they felt they were needed and incidentally avoided taking direct orders from others. Kaitar shamed them into being more team oriented, so they maintain a housing unit where everyone knows the Chameleon Skinks are. That way, if another Lizardmen needs to talk to the Chameleon Skinks they know where they can go instead of the old method of loudly shouting “I wonder where the Chameleon Skinks are?” over and over until a Chameleon Skink approaches them. As talented as Chameleon Skinks are at staying very still, they don’t like to stay still if they aren’t actually on a mission. When not on a scouting or hunting mission, they like to keep their hands busy. Their blowpipes are pretty much identical to the blowpipes used by Sotek caste Skinks, but Chameleon Skinks prefer to craft their own weapons. They are perfectly capable of fashioning weapons and ammo in the deep jungle, but the Chameleon Skink housing unit is also the Chameleon Skink armory packed with dozens of extra blowpipes and hundreds and hundreds of hand crafted darts. When feasible they like to cure their own meat, weave their own rope and pretty much be as self-sufficient as possible. The areas not occupied by sleeping Skinks are packed with supplies of various kinds. The supplies are not packed neatly. Piles of various things are strewn about everywhere. Even indoors, Chameleon Skinks like varied things to hide behind and in front of. Just because they are trying to make themselves more accessible to less stealthy Lizardmen doesn’t mean they don’t want to have fun surprising visitors to their home just to prove that they can. Klodorex is northwest of three out of four of the Big Four temple cities, and they are northwest of most occupied ruins and various kahoun too. Thus, friendly visitors usually come from the southeast. Klodorex built a small cluster of buildings to formally welcome guests. The Entry Way is a cluster of buildings, not a single structure. Even visitors from the north, mainly Hexotal and Spektazuma, they will usuually swing around south out politeness if they aren’t in a particular hurry. There are horns and bells to announce visitors. Fires can be lit too. Basically the higher status the visitors, the more fanfare is made, and of course if the visitors are announced in advanced (or spotted by a Terradon patrol or other advance scout), more elaborate preparations can be made. The entry way also contains a shrine to Uxmac. It is customary for Lizardmen on long journeys to make offerings to Uxmac before embarking on a long journey and to thank him for a safe journey upon reaching their destination and the shrine is used for both these types of prayers. The Entry Way does have some watch towers, barracks, and a small armory. Klodorex wants their guests to know that they will be safe, but they aren’t above showing off their military prowess to their allies too. The fortifications are more than symbolic. The southern entry way overlooks the Llama Fields which arguably represent the most vulnerable approach to Klodorex for reasons that I will cover later. Besides ceremonial and military buildings the Entry Way, there are some stables for visitors to keep their Stegadons and other beasts. Guests usually will sleep deeper into the kahoun (there are plenty of places to choose from! ), but generally their animals get to wait outside so to speak. As one would expect a region that overlooks a place called “the Llama Fields”, there are a lot of pens for llamas in the Southern District. Klodorex can stable hundreds of llamas at a time, but they don’t have enough hay and grain to feed hundreds of llamas indefinitely, so they are generally only stabled en masse during inclement weather, Cold One mating season, or when enemy armies make it too dangerous for the llama herders to let their charges roam freely and graze. Assuming conditions are safe (or as safe as Lustria ever gets), Klodorex’s llamas usually range in and around the Spine of Sotek mountains south of Mount Klodor in the foothills of the Spine of Sotek. Llamas are pretty surefooted and they are relatively safer from predators but still have plenty of edible vegetation for themselves amidst the less densely forested hills. Generally only a few llamas are in the stables. These are usually nursing mothers with young not strong enough for travel, llamas sticking around only long enough to be sheared, sick llamas being nursed back to health, and/or lamas awaiting their final journey to the meat houses. Far away from the llama stables but still in the southern district are the Cold One stables. They are still relatively close to the llamas, but the Cold Ones are rarely far away from their Saurus riders who are pretty good at reining their impules in. The Cold Ones also like to exercise in the Llama fields (not the same time there is llamas there of course unless the herd happens to needs thinning and the Cold Ones are hungry). There is a small set of beast enclosures that were built in the southern district during Klodorex’s construction boom. The big dinosaurs are usually stabled in the east, the Salamanders in the west and the Razordons in the north. Who does that leave that isn’t a llama? All of them. If a cold blooded beast is sick or injured and the Skinks are reasonably optimistic that said beast can recover they will often be quarantined in the Southern beast enclosures while enjoying lots of fresh llama meat. In other words this serves as the Klodorex Veterinary Hospital. If a beast can’t be saved. Well you got a bunch of trained llama butchers on hand to quickly put down the poor animal with a minimum of pain, and then carve it up for meat. They have one more set of “stables.” Guinea pig pens. If you surveyed a thousand Sauri and Skinks and asked them their favorite foods were, guinea pig meat would probably not be in any Lizard’s top three favorite foods, so Klodorex usually only keeps about a couple hundred guinea pigs. Guinea pig meat is a backup source of protein. If there is a major shock to one of their more important food supply, they could potentially expand their guinea pig “herd” ten times over in a single year. I already covered Klodorex’s southern Uxmac shrine. In case it needs to be said every district has its own Itzl shrine or temple near wherever the cold blooded beasts are kept. Klodorex is practically drowning in Sotek and Itzl shrines, but they only have one Caxautn shrine. A popular saying is that Caxautn’s proper temple is under the jungle canopy. There are almost no temples to Caxautn in any temple city or kahoun but most places have a shrine at least. Klodorex’s Caxautn shrine is off to the side the southeast border of the city proper. The Caxautn idol is directly facing the main mountain pass between Mount Klodor and the big southern expand of the Spine of Sotek mountain range. That is appropriate because a lot of large dinosaurs regularly migrate across this pass. Also if you follow where the idol of Caxautn is looking really far you’ll hit the dead center of Lustria’s Great Jungle where the biggest and meanest predators dwell. Admittedly, this is probably the least exciting district in Klodorex. The northern district has two general features of note. One, it’s on the edge of the water table fed by the Biting Bogs, so most of Klodorex’s wells are here. Two, this is the kahoun's "industrial park" to use a blatantly out of place modern phrase. Razordon occasionally freak out and shoot barbs in all direction when spooked by loud noises. Outside the annual Sotek Festivals, the northern district is Klodorex’s quietest district. Except for during aforementioned Sotek celebrations, this is the safest place to keep Razordons. Also the abundance of nearby wells means filling their artificial swamps is quite easy, so the Razordons are very comfortable here. Klodorex houses a lot of Sotek shrines, but only one Temple of Sotek. During the aftermath of the Clan Pestilens War, the Northern District had the most unused space, so this was where Skinks clamored to build a big stepped temple to Sotek here. It’s bigger than every temple except the Great Temple and the later built Temple of Xholanka (which as mentioned is a near perfect replica of the Great Temple). Not much more to say, Skinks gather to worship Sotek here. They have a sacrificial altar and modest sized courtyard near it. For safety and convenience, most Sotek sacrifices are outside the Klodorex kahoun limits but captured enemy leaders are sometimes brought here. Less imposing but much older is the Temple of Potec. Pointed towards true north, it symbolically protects Klodorex from the northern Chaos Gate, emphasis is on the word symbolic. If the Slann or Skink priests want protective wardings that work, they go to the mountaintop temples. This temple is just for what we called “hope.” Lizardmen will gather near the temple to pray to Potec for protection during time of woes. Worker caste Skinks easily make up the largest demographic in Klodorex but the northern district is really where they are large and in charge. The northern district is the center of industry. If something is constructed and doesn’t involve kiln fired pottery or bronze working, it’s here. If collected wood isn’t destined to be fire fuel, it’s worked into boards for construction or shafts for tool and weapon handles in the northern district. The tools and weapons are crafted here in the northern district. Obsidian or other stone is shaped or sculpted here. Blowpipes are shaped here. Darts, arrows, and javelins are assembled here. Baskets, textiles, and ropes are woven together here. Animal fat is rendered into candles and soap here. Leather is cured here. You get the idea, if it’s crafted, shaped, or processed, it’s probably made in the northern district. If meat or harvested produce is consumed fresh it goes straight into Klodorex’s hungry mouths, but if food needs to be pickled, dried, cured for consumption later, the food is processed somewhere in the north district. Speaking of food, the northern district produces a lot of food too. The staple crops are in massive fields surrounding the Kahoun, but the herb gardens and fruit orchards are scattered about the city and at least half the “urban” gardens are in the northern district. In addition to the gardens, the northern district has a few insect hatcheries and fungus farms, particularly since the northern district is pretty damp. The underground water table fed by the Biting Bogs and the rain that falls upon it extends to the northern portion of Klodorex. The majority of Klodorex’s cropland circles around as a band surrounding the northern, western, and a portion of the southern districts of the city. The majority of the cultivated land is for growing corn, but Klodorex grows a lot of things. Squash and beans are the most common non-maize crops. There are groves of fruit and nut bearing trees out here as well. It’s the damper portions of the fields, mostly the northern portion, a few ponds and streams have been cultivated into fisheries. In a few otherwise unworkable spots too dry for seafood, too damp for regular crops, mushrooms are cultivated. The neat orderly rows are dotted here and there by simple two story towers made of mud bricks. These are not military towers which would normally be made out of stone. The lower levels hold tools, supplies, or temporary storage of harvested crops. The upper levels are where Skink farmers sleep. Like a lot of cases with Klodorex construction, the Kahoun has more of these towers than they really need. The towers are not military towers but combat trained Skinks do stand on the roofs for target practice. The targets are any animals that might try to eat the crops. And if the animals shot down are non-poisonous, they can be cooked into a stew, so the fields keep feeding the Kahoun. Skink skirmishers also hunt critters patrolling the area. Klodorex lets Huagerdons and cats roam freely here and “patrol” the area in their own way for rodent sized “attackers.” There are two other lines of defense against rampaging herbivores. The fields are surrounded by a tall wooden fence. A short way beyond the fence, Skinks have cultivated some of the smelliest plants they could find in Lustria to repel larger herbivores like Stegadons. If Klodorex happens to have a Carnosaur in Klodorex, some unlucky Skinks get to collect the urine and mark the Kahoun’s borders as Carnosaur “territory” in an effort to discourage megafauna from stopping by. Enough enemy armies have attacked through the southwestern fields that Klodorex has partially militarized their anti-critter fence. It’s uncommon, but not unheard of for the Burnface tribe of Orcs and Goblins to occasionally raid the area only to steal food, not to attack the Lizardmen. Not a good idea because Klodorex is usually content to ignore the Burnface tribe completely as long they are keeping a low profile. A food raid reminds the local Lizardmen that the greenskins exist. There are wooden shutters that can be opened to create small gaps in the fence to fire bows, blow pipes, or javelins through. Less commonly but still possible, Saurus spearmen can open gaps to fight anyone approaching the stockade. The wooden fence is spiked at the top and bottom and there is a shallow ditch around the fence. There are a couple towers along the border of the fence, but not enough to force every invader to get shot at from a tower. The towers probably won’t be fully manned unless long range scouts spotted the enemy before they reached the fields. The towers are meant more as watch towers than guard towers, but they are better than nothing. In general the fortifications are more like a speed bump than an actual defensible position. It’s not particularly hard to breach the fence. If they do, the fields and farm towers provide nice cover for Skink Skirmishers to make their short march to the Kahoun pretty miserable. If Klodorex loses all their crops here, they will be inconvenienced but not forced into a famine. If they need to sacrifice their cropland to buy time to mobilize defenders for the city and the Monument of Izzatal, they will do this without hesitation every time. The eastern half of the base of Mount Klodorex has been mostly terraformed for terrace farming. Here’s a picture of a modern terrace found in the Andes I found with a google search. They don’t have a critter fence or stinky plants to keep thieving herbivores away but as alluded to before, the base of the mountain represents the gateway to the Kahoun’s holiest site, so it’s heavily patrolled by Sauri and Skinks, and while patrolling for actual enemies, they can clear out any mundane pests that the foreboding mountain doesn’t keep at bay. I figure the predominant crop on the eastern terraces are potatoes. There are few patches of other root crops for variety. There’d be a couple fruit trees here and there but spaced out more than a typical orchard does in order to avoid providing cover to enemies trying to ascend Mount Klodor. Besides the aforementioned stairs and switchbacks, there is another path, called Tzunki’s path, but it does not go up the mountain, it only goes up about a third of the mountains height to a natural mountain spring that the Klodorex Skinks have affectionately called the Heart of Tzunki. Over the centuries, more and more of the path has become lined with stone and wood idols created by Skinks in Tzunki’s honor. In fact, worshipping Tzunki at the spring is now more popular than worshipping Tzunki at the Temple of Tzunki. Most formal worship rituals in Tzunki’s honor involve filling a ceremonial container with water from Tzunki’s Heart and carrying it in a formal procession to the temple. The Heart of Tzunki flows constantly all year long, but during the dry season it’s a pretty paltry flow of water. The spring feeds an aqueduct which can be routed to provide drinking water for the city’s inhabitants or it can be routed for irrigation for their crops. Generally Klodorex’s denizens prefer to use Tzunki’s Heart for their drinking water and use other water sources as much as possible for irrigation. The spring water is not supernatural in anyway, but the spring is naturally filtered, and tastes very refreshing and clean without need for any treatment. Rainfall provides most of Klodorex’s water, but Tzunki’s Heart produces the majority of all other water. Any shortfalls are made up by dozens of wells. Klodorex has ponds, streams and the like, but apart most of their nearest water bodies are pretty murky, so they are only used as a last resort but they are available as a backup or as “industrial” water (to cool heated metal, moisten clay for shaping, etc). The Llama Fields are also called the Stegadon Fields, or just “the Fields.” They extend from the southern tip of the Eastern fields and loop around to make up most of the southern approach to Klodorex facing the mountains. The eastern border of Klodorex goes straight into mount Klodor making it difficult for casual herders. The western border region to Klodorex is dominated by cropland that Klodorex’s denizens don’t want their llamas to destroy. So that only leaves the southeast as an acceptable approach for livestock. The fields are not deliberately cleared, but grazing llamas do a pretty good job clearing it. Anything too big or hardy for a llama to eat eventually gets chewed up by stegadon since this is where beast handlers usually like to exercise their largest charges as well as their food beasts. The Lizardmen of Klodorex didn’t plan to have a big empty field right outside of town, but they inherited one, so they make the best of it. If the local Lizardmen want a lot of empty space, this is the best place for space. 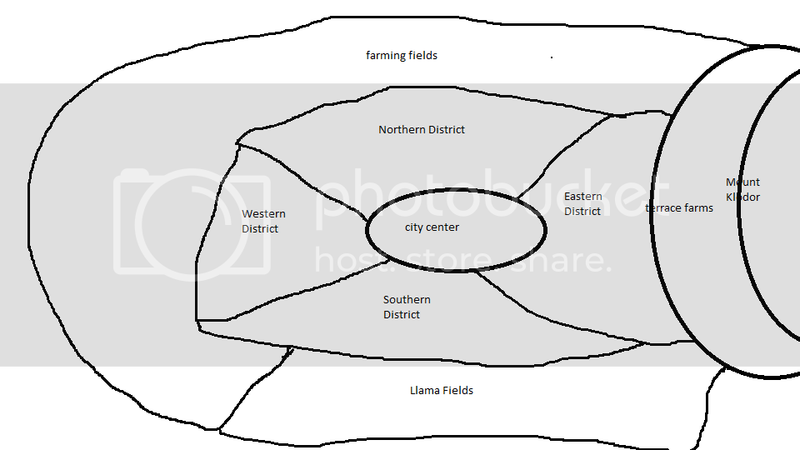 Klodorex can enjoy more assembly space in the Llama fields than anyone in the Kahoun city limits, especially since the city’s building boom encroached on their open plazas. Sometimes religious festivals are held out here. This is also where war games and training exercises take place. Most of the Lizardmen’s foes have superior ranged weapons to the First Children of the Old Ones, but they cannot use their long range weapons very well in the deep jungle which provides both hard and soft cover. The jungles and swamps favor the hit-and-run attacks from Skinks which of course rely on short range missile weapons. If a hostile force wants to attack Klodorex and if they have accurate maps and long range weapons, especially artillery, they will try to engage the Lizardmen in the Llama Fields if they can manage it. The lack of cover means they can engage Lizardmen at greater range than the Lizardmen can manage, and the Skinks have no cover for their hit-and-run forrays. If the enemy reaches the Llama Fields, the Lizardmen have to charge or let the invaders into the Kahoun itself. Not being stupid, the Lizardmen of Klodorex will of course try to engage enemies much farther from Klodorex than the Llama Fields. Ideally they will fight enemies in the Jungles of Green Mist or the Biting Bogs. That’s why they deploy lots of recon patrols in the air and on the ground. They want to spot enemies as far away as possible. It is uncommon for an invading force to sneak through the Jungles of Green Mist undetected and managed to loop around to attack Klodorex from the south, but this has happened often enough that Klodorex built a handful of watchtowers where the Llama fields give way to the jungle and they can light signal fires to quickly warn the city of enemy approach from the south. If they have more advanced warning, they can hide some Razordons, Salamanders, and Skinks to launch a surprise attack on the rear of any enemy who thought they succeeded in approaching the Llama Fields undetected. The Lizardmen of the Klodorex use the Llama Fields for war games. One game that the Skinks and Kroxigor “play” is to see how fast they can set up fences and trenches complete with wooden spikes which is good practice. During a real invasion, these spikes are poisoned. Most invaders would rather deal with these obstacles than the natural swamps and rainforests of Lustria, but this is one more obstacle Klodorex has learned to put between themselves and their foes over the centuries. Some Skink chiefs have argued that they should permanently fortify this area but no one has defeated the counter arguments “Where are you going to get the troops to garrison these fortifications?” and “Where do you propose we let our beasts graze and roam if not here?” So the fields generally only are manned and fortified during war games or actual wars. It is theoretically possible for an enemy to swing further south and go around the watch towers but this will require invaders to cross the Spine of Sotek mountain range. That’s more work than most invaders are willing to do. Invaders can get around both the Spine of Sotek and the watch towers alike by coming from the east shore of Lustria, but that’s a lot of jungle to march through. Skaven scouts and spies have come from this direction during the Clan Pestilens War, but no army has ever tried this approach for many centuries unless they were hopelessly lost and accidentally stumbled in this way, in which case they were too tired and sick to put up any real fight. The sole exception is very recent. The Chaos sorceress Adrienne became the first general to deliberately attack Klodorex from the east with a large army (though she tried to go around the Kahoun, she wasn’t naïve enough to expect them not to oppose her), not having access to the Dark Way her only other option would have been to sail around the whole continent. Southeast of the Kahoun, near the mountain pass but away from game trails that mega fauna use is an altar of Sotek. This was created during the time of Tehenhauin in order to sacrifice Skaven at. It wasn’t used much because Skaven were not caught in general vicinity very often. Fewer than a thousand Skaven died on this altar. It has been used even less in the centuries following the Clan Pestilens War, but it is still lovingly maintained by Sotek’s faithful to this day. In response to the Dark Elves invasions of Klodorex, the Skinks erected a second altar of Klodorex a modest march outside Klodorex in the Jungle of Green Mists. It’s not used a whole lot, but it sees far more regular sacrifices than the older Sotek altar does. There is a very small temple to Caxautn erected southeast of Klodorex in the jungle that is maintained periodically and used for Cautxn ceremonies. Sites of major battles have modest memorial markers. The most common is to make a pile of stone. Each stone had a glyph representing a single deceased First who died in service of the Old Ones. In most cases the glyphs are unreadable after years of weathering, but that’s not seen as a major problem since the dead are collectively mourned and celebrated. A Skink out hunting or patrolling has no problem pitching a tent, making a temporary shelter out of natural materials or sleeping in a tree or cave, but they still like nicer accommodations when they get them. Any wilderness area that gets patrolled frequently may have some jungle huts built there. These serve both as safe houses for Skink patrols and as supply depots. Klodorex has dozens of sites like this. Most of these are just one to six huts in the jungle that usually sit empty. They might be stocked with supplies that animals won’t try to eat like javelins and blowpipe darts. One of the few camps that is always occupied by at least a few Skinks is a short distance north of Klodorex where the Jungles of the Green Mist and the Biting Bogs intersect. This not quite jungle, not quite swamp is teeming with a wider variety of animal and plant life than seen in the average stretch of Lustria. Whether you want poison for your blowpipe darts or meat to feed the Kahoun’s hungry Kroxigor, this is the richest pickings for hunting, fishing, and foraging. A couple ponds and streams have even been tamed to become managed hatcheries which provide a lot of Klodorex’s seafood. Since Klodorex has stepped up their military patrols into the Biting Bogs, the hunting and fishing camp has been expanded with even more huts, to give patrols a more convenient place to rest and resupply. Klodorex is the nearest Lizardmen population center to large swaths of the Spine of Sotek mountains. If another temple city or Kahoun decides they want to open a mine in the mountains, they will usually tell Klodorex. They will then send periodic Terradon messengers back and forth to make sure the settlement is okay. They will often send some food and supplies and try to incorporate the mining camps into their extended patrol routes though the latter is difficult, particularly since Klodorex is under direct Slann orders to patrol the Biting Bogs now, so Klodorex long range patrols are stretched pretty thin since they now have to patrol all four cardinal directions. On the plus side, these mining camps from allied Lizardmen usually give a percentage of their yield to Klodorex as a consideration for the food and supplies provided. Klodorex hasn’t had to actually mine their own metals in a very long time. This may change because the Skink leaders want to build up an arsenal and the Big Four are sending fewer mining expeditions near Klodorex. Thanks Itza! Jerk. Remember when I wrote this general piece on building logical cities? Time to make sure I hit all the bases. Water: There is plenty of rain. While Klodorex is placed at the biggest gap in the Spine of Sotek mountains they still enjoy the nebulous benefits of the mountain range’s rain shadow. They can water most of their crops with natural rainfall. They can collect a lot of water for drinking and industry by putting out rain barrels and the gutters and aqueducts help funnel water to useful places without making Kroxigor need to carry pots of water the whole way. A lot of the excess rain water is funneled by aqueducts and ditches goes to the reservoir, nicknamed Tzunki’s Bladder near the southwest field’s crops. If the northern terrace crops need irrigation, they have to be irrigated the hard way (Kroxigor carrying water) but the northern crops tend to be composed of less thirsty plants, so this is rarely needed. The Heart of Tzunki provides naturally filtered tasty wonder in fairly copious quantities. The same aqueduct system that redistribute rain water also helps redistribute this water. Klodorex also has some wells that they tap during the dryer parts of the year or just for convenience if a section of the city is far from an aqueduct. Klodorex does have natural bodies of water near it, but they aren’t really tapped for drinking water except as a last resort. Water from wells, the Heart of Tzunki, and the rain is usually more convenient or cleaner if not both. Flood Control and Storms: Most of Klodorex is built around the base of Mount Klodor. Water flows downhill. That means that flood waters tend to flow away from Klodorex, so flooding is less of a problem here than for most Lizardmen cities. There are ditches in strategic places to help water flow away from places where they can do a lot of damage. A lot of water naturally goes into the reservoir known as Tzunki’s Bladder. If the reservoir is in danger of overflowing or breaking under too much pressure, water can be redirected into an aqueduct that acts as a release valve and dumps excess water into the Llama fields. Heavy rain can cause rock slides and mudslides on Mount Klodor. The top of the mountain in and around the temples is mostly solid stone, so heavy rains causes little problem to the holy site, but the rest of the mountain is dangerous during heavy rains, not to mention lightning strikes. It’s just a good idea to stay off the mountain during storms, but the various fortifications along the slopes can serve as storm shelters in a pinch. There are a couple retaining walls built into the mountain over the centuries, but not many. For the most part the First of Klodorex, if a mudslide washes out a portion of the switchbacks or stairs, it’s not very difficult to have Kroxigor clear away the obstruction and Skinks repair the damage. The terrace crops at the base of the mountain are mostly root crops so they can take a beating on the surface without hurting the harvest yield too much. The Monument of Izzatal is the highest object for miles and is covered in metal. It get struck by lightning a lot but due to good craftsmanship and magic it can survive an almost infinite number of lightning strikes. Since it acts as a lightning rod, this protects the temples from lightning strikes. The temples also benefit from both magic and good craftsmanship. Mount Klodor as a whole is a dangerous place during storms, but the temples are actually very safe places to be. Below the mountain, Klodorex has far more buildings than its population needs, so no one has to make due with subpar shelter. It is not hard for everyone to hunker down in an interior room somewhere if the skies turn nasty. Food: Klodorex has relatively little issues feeding it’s population and they can usually supply extra food to allies though they are geographically removed from most other Temple Cities, they are the proverbial bread basket that provides food to most Lizardmen mining camps in the northern section of the Spine of Sotek Mountains. As mentioned before they have two major fields. The northern terrace crops and the southwest fields. Klodorex has some roving llama herders in the general area. While the First of Klodorex don’t usually mess with drinking from streams and ponds, they have no problem tapping these places for seafood, a couple of the closer bodies of water were teraformed and selectively bred to create hatcheries. They cultivate insects and fungus too. The city has orchards and gardens too. Guinea pigs are kept in pens as a backup source of meat. Klodorex needs to patrol the Jungle of Green Mists because that is a popular invasion route for Dark Elves. They have to patrol the Biting Bogs, because they have two powerful enemies imprisoned there. When patrols circle back to Klodorex to give their reports and take a furlough they are expected to bring some food back with them. Beyond incidental food gathering from patrols, Klodorex sends out hunting expeditions periodically, especially if a feast is coming up. They have one permanent hunting camp up north that is surrounded by some pastorally managed groves and fish hatcheries. Sanitation: If someone has to “go” on Mountain Klodor it’s polite to do it off the trail. Higher up the mountain, Skink attendants in the temple area will dutifully scoop up waste and dump it off the east side out of sight. Groundside, the First Children of the Old Ones go in designated facilities where their waste is collected and hauled away and unceremoniously dumped in the jungle. Animal waste accumulates everywhere and a dedicated task force scoops this up and hauls it to either of the two cropland areas or one of the hatcheries for fertilizer. Fires and Fire Control: There is plenty of surrounding jungle to let Skinks and Kroxigor gather firewood without needing to walk very far or permanently deforesting the surrounding area. Firewood is sort of a pain to haul up Mount Klodor but the four great temples and the support buildings are actually magically heated, so they don’t need fires on the mountain top except for cooking or to provide light at night. Unwanted fires are a lot more difficult. Most of the fire intensive industries, metal working, pottery, and similar industries are mostly located near the reservoir in the western district of the city. If there is an accidental fire in this area, the reservoir valves can be open and they theoretically flood the problem away in emergencies. For a less severe fire, the reservoir can create a smaller running stream of water to fill up a big bucket brigade and they happen to store a lot of buckets near the reservoir for just this purpose effectively making this Klodorex’s main fire station. There is a secondary fire stations in every other district. There is a stock pile of water buckets near the Temple of Tzunki in the Temple District in case there is an accidental fire in the city’s critical area. There is a similar back up fire station near the Heart of Tzunki in case there is a fire in the eastern section of the city. The northern district has a modest stockpile of buckets near their best wells. The southern district has the fewest fires and the least sources of water, but they stockpile water to water their many beasts and this water can be re-purposed to fight fires in a pinch. Mount Klodor does have flammable vegetation on it, but not as much as most of Lustria. If there is a fire on the mountain the temples are well past the tree line so there isn’t sufficient fuel for a fire to threaten the Monument of Izzatal, the four temples, or the temple’s support buildings. If there is a fire below the mountain outside the city, Klodorex workforce can and will sacrifice the exterior half of their southwest fields to make a wall of dirt to deny an approaching fire fuel. Time permitting they will do this in the Llama fields too but there is not nearly as much fire fuel there to begin with there, so that is rarely needed. Wild Animal Management: Large wild animals are not really a problem but they can’t be ignored. Klodorex basically is built on a mountain pass in the Spine of Sotek. That means migrations of beasts crossing either side of the mountain pass are likely to pass nearby. Nearby does not mean through the Kahoun, but sometimes large herbivores will make a detour to munch on Klodorex’s crop land and predators will follow these herbivores to feed on them and then go after Skinks. Major migrations of wild beasts usually occur at very predictable seasonal intervals, so the First of Klodorex can take precautions. Common precautions including using fire, noise, or even a small army to drive animals away from the city. They also know what smells repel Stegadons and other large beasts and can harness these selectively. They can also deliberately lure beasts away with tasty food. Carnosaurs, Cold Ones and pretty much every predator in Lustria is relatively easy to lure away with a trail of a freshly slain llama entrails. Most herbivores have favorite foods that can be used as bait to lure them away from the city too. The biggest problem with animals is poachers of their crops. The main fields have a wooden fence around them to keep critters away. The northern terrace crops are patrolled by Skinks that can kill marauding herbivores if need be. Both fields also have friendly predators like cats and huagerdons “patrolling” them. Since Klodorex is surrounded by cropland on two thirds of it and a big empty field on the remaining third, it’s very unlikely that a smaller animal capable of harming a Skink or other First is going to actually reach the city. A quick javelin or dart will fix the problem if this happens. Domesticated and Tamed Animal Management: Razordons are kept in the quiet north district where loud noises are unlikely to spook them. Salamanders are kept near the reservoir as an-anti fire precaution. Stegadons, llamas, Cold Ones have stables, but they need to be exercised a lot, so they are kept near the edge of the city. The llamas spend most of the year outside the cities and only tromp through the Lama Fields en masse a few times a year. Places to Sleep and Work: Given that Klodorex has redundant buildings, everyone can pick a nice sleeping area near where they work, unless they work in the City Center (the only place where space is at a premium) in which case they have to make a modest walk to and from work. If the Lizardmen need empty space to do something their options are pretty much the Llama Fields or nothing. Places to Worship: Apart from the Great Temple and the four mountain temples, Lizardmen can access most temples with a minimum of fuss. Access to shrines is not restricted at all. Minor religious gatherings are near the associated temple and involve the cramped streets and plazas in the vicinity. Large religious festivals are either held throughout the city simultaneously, in the Gathering Place, or in the Llama Fields (after a thorough removal of manure). Defensive Strategy: Klodorex has to guard the city center, the Slann, their spawning pools, the sacred mountain, their crops, their general population, a small Daemon prison, and a handful of exterior settlements. That's a of territory to secure with less than two thousand full-time soldiers. I covered a lot of fortifications, both permanent and makeshift, but in order to man all their fortifications, the regular day-to-day work of the Kahoun has to come to a standstill. The Terradon riders, Chameleon Skinks, and Skink hunters/scouts are very busy. Klodorex needs to spot where the enemy is coming in advance, so they can project their forces the direction the enemy is rather than defend all four cardinal directions simultaneously. Warden and thedarkfourth like this. Spoiler: Laughable Crude Map of the City Layout. Warden and Rednax like this. Wow @Scalenex there is a ton of information here. You basically wrote a college thesis on your temple city... this is going to take some time to read! So far I have only read the first post on this monumental piece of lore, and I quite enjoyed going through your thought process as you tried to place the city of Klorodex directly into the setting by using the lore you had already created. I definitely did the opposite when I worked on my temple cities fluff, and as it happens I wound up putting mine almost directly due east from the general area of the Izzatal monument, closer to the coast (and my Bretonnian colony). I really enjoyed the justifications for where your city is located, and the development and fleshing out of what used to be just a few meaningless names on a map, and how you have populated it with interesting stories and characters. This was definately not how I was pronouncing Klorodex... is there a pun I am missing all this time?? I am a big fan of this idea. I never got a good feeling for how many 1st Gens were around at the time of the Old Ones, and I think this justification for his death is sufficient. I would lean towards option A, allowing Spektazuma to still mostly exist, but still be a good deal ruined. But mostly because of depopulation/subsequent incursions, and not because of the whiplash of magic used against the daemon hordes.Having the war come right into the city epi-center would cause too much catastrophic damage. Or maybe that does work? If Spektazuma isn't used too heavily in your works, it could be a justification to why it isn't visited often: too ruined to be worth it except for specific ceremonies/defense. This is an interesting idea; Skaven needing a river crossing and plundering a city to find one; maybe an underground route? "The worlds most dangerous river" is probably filled with piranhas and other things that would love to eat swimming rats. I wrote science fiction stories when I was 12 to 16. In hindsight these stories embarrass me now as an adult, but I still sneak stuff from my old stories into my new ones. My favorite (overly perfect Mary Sue-esque) alien race's home world was called Klodorex. They also used the suffix -ex to end all proper nouns. "Scalenex" was my old Marty Stu character. No pun, I just pull stuff from my old stories for nostalgia. Now that I'm working on a side project of my own fantasy world, I've been recycling names from important characters from major characters for my LIzardmen fluff. I don't believe the Skaven cannot cross the river, but during the Clan Pestilens war, they were using blitzkrieg tactics and just wanted to kill as many Lizardmen as fast as possible. They went after the easiest targets to reach. If they are aiming for surprise rather than brute force, then they'd probably try to go over or under the river. Mostly though I find Chaos makes more intriguing villains than Skaven. Klodorex Lizardmen fight Skaven because Skaven are their racial enemy but the Skaven never did anything to Klodorex to make it personal. Klodorex isn't a very juicy target to the Skaven. I'm sure they wouldn't mind capturing the Monument of Izzatal but that's not only above ground, it's on a mountain top, and a would be villain needs to hold on to it at least a day. They cannot take it secretly, it needs brute force, not their bailiwick, and if they do want to use brute force, better to go after one of the Big Four. Photobucket gives and it takes away, but it's fixed now. I can see it at least.